APS Middle School Montessori . . .
What a child learns in each year builds on what was learned in previous Montessori years. The Middle School Montessori program continues this learning, building a strong educational foundation for high school and college. In middle school, students are ready to leave behind the hands-on manipulative materials used in elementary Montessori and learn through reading, listening to lectures, discussion and research. social justice and working with respected mentors. Middle school Montessori teachers consider the whole child and support those values, which encourages student growth and fulfillment. Instead of competing with each other, students cooperate, help each other and work together on group projects. They are expected to manage their time and work load independently, and produce quality work. Students help run and maintain the classroom, and work to raise money for field trips and other activities outside the school. 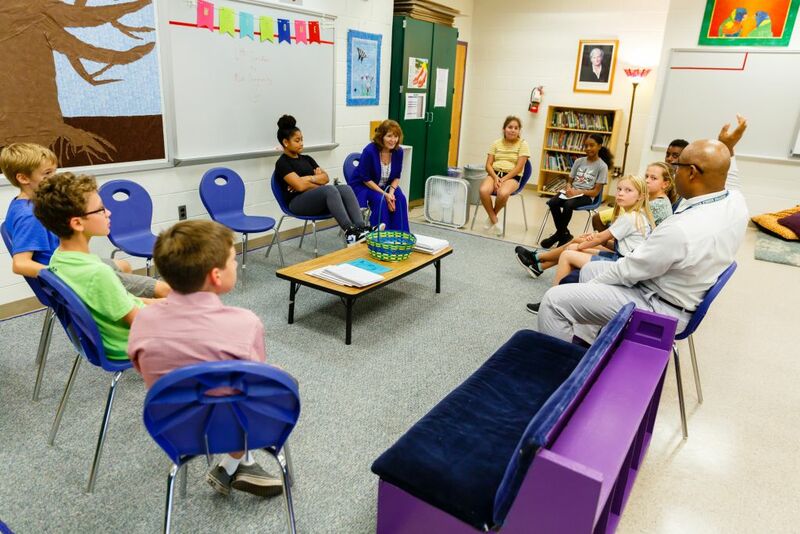 Montessori students at Gunston Middle School spend much of their day in two connected classrooms, their home base.. From that secure home base they can also be active in overall student life. Every student takes daily electives, such as languages, band/orchestra, PE, art, tech ed, and video production. Gunston is an exceptional state-of-the-art facility and offers dozens of after school sports, clubs and activities (plus a late bus! ).